﻿Pi Day: Calendar, History, Tweets, Facts, Quotes & Activities. Pi Day celebrates the mathematical constant π (pi) or 3.141592653... . Pi is the ratio between the circumference (the distance around the circle) and diameter (the distance through the center of the circle). Pi is a constant, therefore it will be the same for circles of all sizes. Pi is a special number due to its infinite and patternless nature, meaning that the digits after the decimal point never repeat themselves in a specific order. 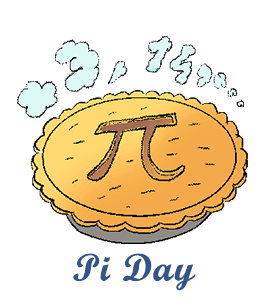 Pi Day celebrations originated in 1988 at the San Francisco Exploratorium when Larry Shaw, a physicist at the Exploratorium, organized the first Pi Day. It was held on March14th (3/14), given that the first digits of Pi are 3.14. Celebrations at the Exploratorium included taking young museum visitors on a parade to the Pi Shrine, which is a round brass plaque fixed on the floor of the museum and serving fruit pies to visitors. Since then, Pi Day celebrations have spread both nationally and globally. On March 12, 2009, the U.S. House of Representatives recognized March 14, 2009 as National Pi Day. In 2015 at 9:26:53 (AM and PM), all of the first ten digits of Pi (3.141592653) were present in the date and time. Pi is an irrational number, meaning it cannot be expressed properly as a fraction. Albert Einstein, widely referred to as the father of modern physics, was born on March 14, 1879. Therefore, Pi Day also recognizes Einstein's birthday. According to the Guinness World Records, Rajveer Meena from India holds the record for memorizing the most decimal places of Pi. On March 21, 2015, Meena wore a blindfold and recalled 70,000 decimal places of Pi over a period of 10 hours. Memorize as many digits of Pi as you can (remember, the World Record Holder was able to memorize 70,000 decimal places of pi). Go for a 3.14km walk to celebrate Pi Day.